It took two years after ground was broken in June of 1887 for tradesmen to complete the massive, two-hundred room Spalding Hotel, built to rival the St. Louis Hotel one block east. Although the hotel’s investors included such prominent Duluthians as R. S. Munger, G. G. Hartley, Owen Fargusson, Luther Mendenhall, and George Spencer, it was named for the group’s president, William W. Spalding, a Pennsylvania native who first came to Duluth in 1869 with his brother. Together the Spalding brothers built a general store on the southeast corner of Superior Street and Fifth Avenue West, the same spot on which the Spalding would rise twenty years later. 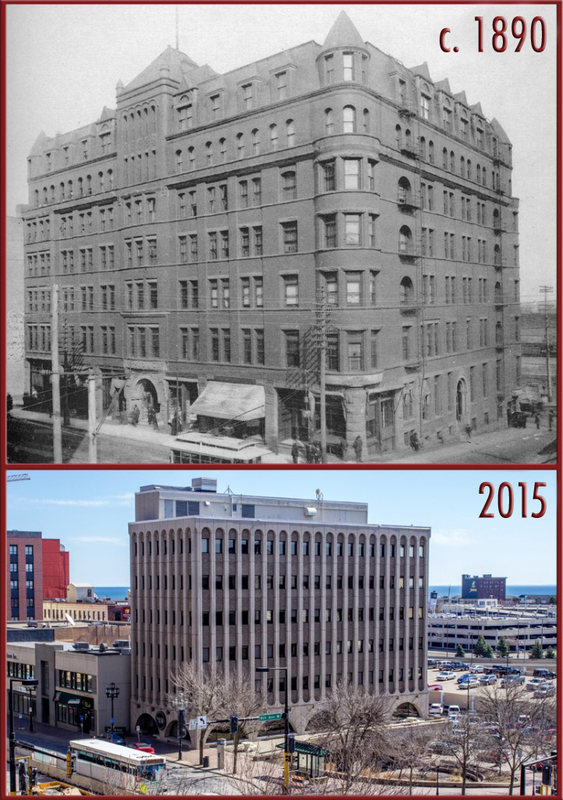 Standing seven stories high over Superior Street and eight stories over Michigan Street, the Spalding dominated downtown Duluth when it was first constructed. Built of brown sandstone, red brick, and terra cotta, the Spalding’s top floor was capped with a mansard roof covered with tile shingles and featured many dormers and round corner towers. Its architect, Chicago’s James J. Egan, was nationally known for his church and hotel designs. When it opened, the Spalding was described as an “artistic blending of Gothic, Corinthian, and Egyptian styles.” The interior walls were paneled and trimmed with quarter-sawn oak. When it first opened, the Spalding was the only hotel in Minnesota with an “indicator dial” in each room with which the occupant could give up to twenty-seven different orders to the hotel office. Its investors spared no expense outfitting the hotel with the best furniture, carpeting, linens, table wear, and other finery available at the time. Not every sleeping room had its own bathroom, but even the common facilities were elegantly appointed. Like the St. Louis, the Spalding became a popular temporary home for unmarried professional men newly arrived in Duluth as well as traveling investors and land agents. During Duluth’s expansion in the 1890s, many of the real estate transactions that shaped the city took place within its walls. Throughout its seventy-four years of operation, the Spalding hosted many prominent guests, including boxer Jack Dempsey, Presidents Theodore Roosevelt and Harry S. Truman, and Polish Prime Minister (and celebrated pianist) Ignace Paderewski. As the neighboring Bowery — which stretched from Fourth Avenue west to Mesaba Avenue along Michigan Street and Superior Street west of Fifth Avenue — grew around it, the Spalding’s popularity declined and, like many other buildings around it, fell into disrepair. By the time it was set to be demolished in September 1963 as part of Duluth’s Gateway Urban Renewal Project, it had become a residential hotel. Prior to demolition one of the Spalding’s grand wooden doorway arches was salvaged and is now installed in O’Gara’s restaurant in St. Paul. The Ordean Building now stands on the Spalding site. Top Image: Duluth Public Library; bottom image: Jim Davis.